This past Saturday I gave home cheese making a second shot. I supplemented the cheese cultures I already had with Penicillum Candidum and Geotrichum Candidum that I ordered from the New England Cheese Making Supply. The Penicillum is responsible for the white mold you see on soft-ripened cheese like Brie and Camembert. Geotrichum helps the Penicillum by keeping the rind stuck to the cheese, as well as adding some additional flavor. I love making all kinds of foods by hand, but I've got a special goal with this project. Currently, the FDA has a standing ban on the sale or import of any raw milk cheese aged under 60 days. So that means no raw-milk camembert, fresh goat cheese, or triple-cremes (unless you go to Canada). When Carla and I have traveled abroad, we've always been impressed with the young raw milk cheeses we've tried, so I'd like to ultimately create soft-ripened raw milk cheeses for us to consume at home (which is legal). I really enjoy soft-ripened cheeses, plus it's Carla's absolute favorite type of cheese--the riper, runny-er, and gooey-er the better for her. But first I need to become comfortable with suscessfully ripening pasteurized cheeses before I make the jump to raw milk. So far so good, I'd say. 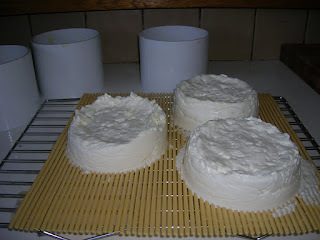 A gallon of whole milk yielded me these three camembert-sized cheeses. I've been drying them and turning them every few hours all day to reduce the watery whey they're seeping off. Now they're going to age at 50 F for a few weeks and keep getting turned every day. I'll post some more photos when a rind starts to come in!